A cameraman for the People’s Army of Vietnam during the Vietnam War, Trần Văn Thủy went on to achieve international fame as the director of films that address the human costs of the war and its aftermath. 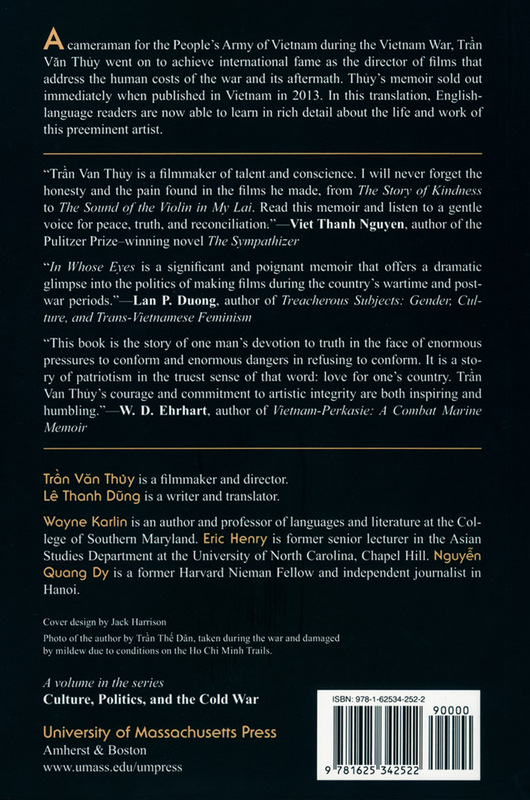 Thủy’s memoir sold out immediately when published in Vietnam in 2013. In this translation, English-language readers are now able to learn in rich detail about the life and work of this preeminent artist. Trần Văn Thủy is a filmmaker and director. Lê Thanh Dũng is a writer and translator. Wayne Karlin is an author and professor of languages and literature at the College of Southern Maryland. Eric Henry is former senior lecturer in the Asian Studies Department at the University of North Carolina, Chapel Hill. Nguyễn Quang Dy is a former Harvard Nieman Fellow and independent journalist in Hanoi. Photo of the author by Trần Thế Dân, taken during the war and damaged by mildew due to conditions on the Hô Chi Minh Trails. Order In Whose Eyes from the University of Massachusetts Press. All text and images are © 2018, Trần Văn Thủy, all rights reserved. Written permission is required for any use.